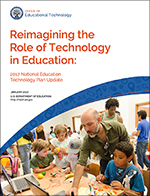 The Office of Educational Technology focuses on using technology to transform learning experiences with the goal of providing greater equity and accessibility. This letter calls attention to disparities that persist in access to educational resources so that districts may address disparities and comply with the legal obligation to provide students with equal access to these resources without regard to race, color, or national origin. Superintendent Steven Webb explains how giving voice and transforming outcomes for all students is top priority in his district. Vancouver Public Schools deploy devices with equity in mind. What do we mean when we say, “Transformative learning experiences powered by technology”?